Fuse! 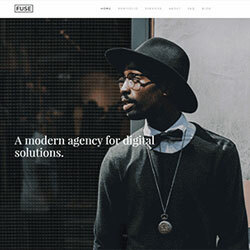 It introduces the new default theme, the first style called Minimal and 8 different page layouts - all wrapped in elegant, web agency themed demo content. The default YOOtheme Pro theme is sporting a classical widescreen layout and is stuffed with features, like different header layouts, a special mobile header and many options to create unique top and bottom sections. The first available style has a minimalistic and modern look. It's light, elegant and focused on typographical details. The topic of the website serves as a perfect basis for any agency or portfolio website and comes with 8 prebuilt layouts: Frontpage, Portfolio, Services, About, FAQ, Case Study, Careers and Press.